2 bedroom 150 year old house in the heart of Lliber, valley views. Casa Menut is a 150-year-old cottage is situated off the Main Plaza in the friendly Spanish village Lliber in the Jalon Valley. Here you can enjoy the wonderful views of the mountains and valley. 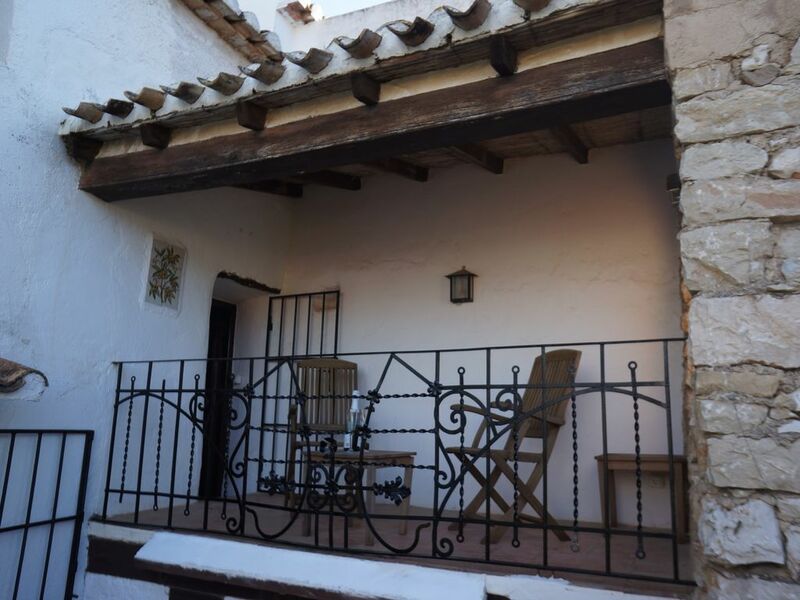 The cottage is within easy reach of the charming village of Jalon. You can enjoy many mountain walks and numerous cycling adventures and is only a 20 minutes drive from sandy beaches that are ideal for children and those relaxing days by the sea. The cottage is ideal if you wish to bring your own bike, as there is secure storage for all biking equipment. Jalon also has Xabia's bike shop if you wish to rent a bike whether that is a mountain bike to enjoy the mountain biking experiences Lliber has to offer or road bikes if you wish to take in the valley scenery by road but if you feel like taking it slightly easier why not try an electric bike. This cottage has a south facing tiled terrace, which comprises of a lemon tree and wooden outdoor furniture, seating up to 4 people. There is also a weber charcoal BBQ for those glorious evenings sitting outside relaxing after a days exploring. There is a small terrace on the first floor where you can enjoy the amazing views of the Jalon Valley whilst watching the sun go down after a day of cycling, walking or just lazing on the beach. There are 2 bedrooms on the first floor sleeping up to 4 people. As you go up the stairs from the lounge you directly enter the master bedroom. The Master bedroom consists of a double bed, built in wardrobe and a seating area to take in the stunning views across the valley. Off the master bedroom is the second bedroom, which has two single beds and a built in wardrobe. The large bathroom is next to the bedroom. In the bathroom you have a bath/shower, one basin and toilet. Downstairs in the living area you have a large chaise longue sofa and television. Go up two steps and you are in the dining room, which has a wooden round table and 4 chairs. The kitchen has all electrical items including a washing machine, microwave oven, gas hob and electric oven. Being in the heart of the village you can enjoy the local bars, butchers, bakers, hairdressers, pharmacy and shop. The cottage benefits from WIFI smart TV, ceiling fans in all rooms except the second bedroom where floor fans are available. All rooms have electric heaters. Dogs are welcome to enjoy your holiday too. A Car is not essential if you wish to stay in the valley during your holiday, as there is a local minibus service from Alicante Airport called Beni-connect, which drops and picks up from Lliber. If you have a hire car there is a village car park available 2 minutes walk from the cottage. Baby equipment is available on request also games and toys. We grew up in the Uk and started to travel 20years ago. We have used our lovely cottage as a home with out our child and also as a family. We currently live in the United Arab Emirates with our child and dog,who has also lived in Lliber with us. We were visiting friends in the area and on our last day were told that a house had just been put on the market, we went straight round to the house and fell in love with it. The beautiful wooden beams and the view across the valley sold it to us. We were living in the Middle East at the time and 6 months later the house was ours and we moved to Spain. Everyone who enters the cottage falls in love with the house it may be because of the thickness of the walls,views, the uneven rustic walls. It maybe in a quiet valley but if you wish to stay active there's plenty of things to do outside. Waking up in the morning and the first thing you see is the Sierra Bernia from the bedroom window is amazing and watching the sunset on the terrace of an evening is beautiful. Spacious bathroom with bath/shower one basin and toilet. Heated towel rail. No air conditioning but ceiling fans in all rooms. Television and a chaise longue sofa. Dishes and utensils for upto 8 people. High chair available on request. Round wooden table and 4 high back chairs. Bicycles not available at the property but storage available if you wish to bring your own or rent one from Xabia bike shop in JAlon. Smoking allowed in the garden or on the terrace. This conveniently positioned cottage can be used as a retreat to get away from it all or if your are feeling more adventurous many activities are available on the doorstep or a short car journey away. If you wish for a welcome pack on arrival please advise at the time of booking and we can arrange this for you making it more convenient to take everything in your stride. La maison est conforme à la description et parfaitement équipée. Rien ne manque dans la cuisine, les lits sont faits à l'arrivée et Fiona répond très rapidement à nos demandes, même sans être sur place ! Nous avons vécu dans le village lors de la semaine Sainte et il faut tout de même signaler que le rythme de vie espagnol est très difficile à suivre à ce moment là avec des nuits très courtes. Mais on partage la vie locale et c'est sympa. Estuvimos en Casa de Fiona a finales de julio y pudimos comprobar que se trataba de "su casa" es decir que no es una propiedad pensada para alquilar si no que es su propia casa que ha decididido alquilarla, es decir tiene detalles de habitabilidad por todas partes, y esta pensada para proporcionarte todas las comodidades. Thank you very much, we are glad you had. a great stay at Casa Menut. We lok forward to welcoming you again. Muchas gracias, nos alegramos de que tenía. una gran estancia en el Casa Menut. Lok hacia delante para darle la bienvenida otra vez. The JAlon valley is famous for its wine. JAlon has its own bodega where you can try before you buy. All grapes have been picked from vines growing in Lliber and Jalon. Lliber offers plenty of walks, through the dry river bed, around the mountains. Lots of flora fauna to see. February is a spectacular time of year to see the almond blossom in its full glory. Cycling is very popular with many professional teams coming to Lliber for pre season training,making the most of the roads through the mountains. If you wish to try mountain biking there are plenty of tracks to follow. Xabia bikes are now situated in Jalon so if you wish to try you can always hire a bike from them. The lovely coastal drives are amazing driving along the coastline of the glistening Mediterranean Sea,stopping off at little coves along the way,enjoying local cuisine. If you wish to relax by the sea there are some lovely sandy beaches with in a 20minute drive. Calpe beach with its magnificent rock and Javea beach with its cosmopolitan feel and many bars and restaurants to choose from. Check out time during July and August is 1030. this is due to the heat. Therefore our change over crew will not get too hot.